Will Jim Brockmire ever get his life back? Has the Brockmire TV show been cancelled or renewed for a third season on IFC? The television vulture is watching all the latest cancellation and renewal news, so this page is the place to track the status of Brockmire, season three. Bookmark it, or subscribe for the latest updates. Remember, the television vulture is watching your shows. Are you? An IFC dark comedy, Brockmire stars Hank Azaria as baseball announcer Jim Brockmire, Amanda Peet as minor league club owner Julia James, and Tyrel Jackson Williams as tech marvel, Charles. Katie Finneran and Hemky Madera return as guest stars in season two. Joining them are Becky Ann Baker, Carrie Preston, Dreama Walker, and Utkarsh Ambudkar. The second season kicks off a year after the events of the season one finale. Although Jim’s Brock Bottom podcast is now a hit, he’s rooming with Charles, and drinking more than ever. He still longs to overcome his “Brutal Brockmire” image and reclaim his sportscasting career, not to mention Jules. The second season of Brockmire averaged a 0.07 rating in the 18-49 demographic and 217,000 viewers. Compared to season one, that’s down by 19% and 12%, respectively. Find out how Brockmire stacks up against other IFC TV shows. On March 29, 2018, Brockmire was renewed for a third and fourth season. Stay tuned for further updates. Despite Nielsen ratings so low they barely register, instead of cancelling it, IFC renewed Brockmire for a second season. Then, about a month prior to the season two premiere, they renewed it for seasons three and four, as well. I’ll still keep an eye on the ratings, to keep myself out of trouble, but it doesn’t seem they are IFC’s main concern. Subscribe for free Brockmire cancellation and renewal alerts. TV show ratings are still important. Follow Brockmire‘s weekly ups and downs. Check the rankings for other IFC scripted TV shows. Find more Brockmire TV series news or other IFC TV show news. What do you think? Are you happy the Brockmire TV was renewed for season three and season four? Do you think it will end there? How would you feel if IFC cancelled this TV show, instead? 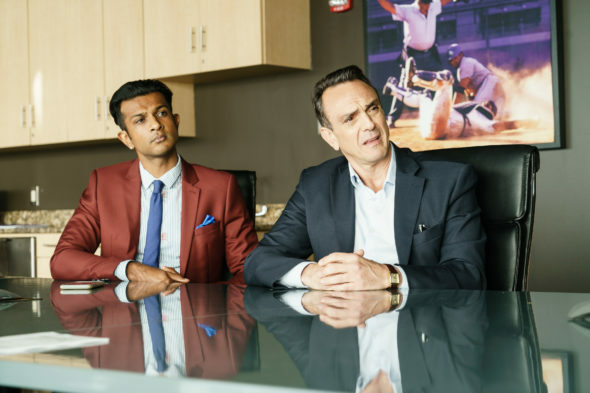 More about: Brockmire, Brockmire: canceled or renewed?, Brockmire: ratings, IFC TV shows: canceled or renewed? Stan Against Evil on IFC: Cancelled or Renewed for Season Four? Stan Against Evil: Is the IFC TV Series Cancelled or Renewed for Season Three?